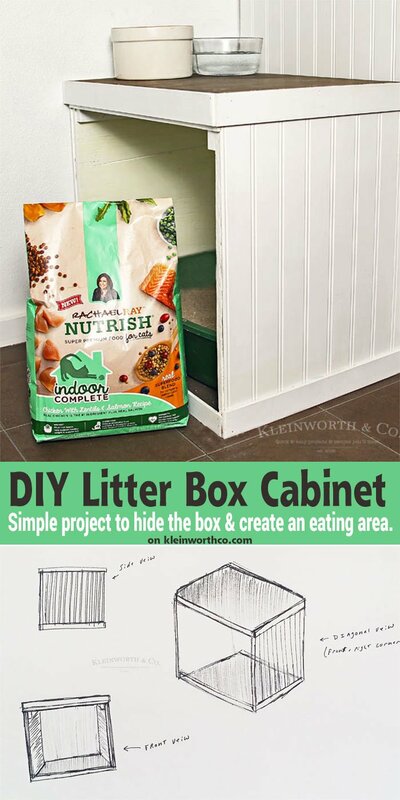 Easy to make DIY Litter Box Cabinet helps conceal the box & creates a space for food & water. If you need a hidden cat litter box, this is a great option. We sure love our pets. They mean the world to us. So we like to do what we can to help integrate their needs with our home & lifestyle. Take the little box for instance. Our cats live strictly indoors, so the litter box is a necessity. But that doesn’t mean I want to look at it all the time. The laundry room is their space where we keep it & their food, which keeps it mostly out of sight. But I really wanted it to be concealed more so it didn’t stand out with the decor in the space. So when we did our laundry room makeover I made sure we built a DIY Litter Box Cabinet to maximize space & functionality while making things look nice too. One of my favorite parts of this box is that it doubles as a feeding spot. You know cats love to perch on top of things & this really makes them happy. I like that it’s away from their box, so the litter doesn’t get kicked into the water. They really love being up there when it’s feeding time & I really love that we created something that not only works for us but makes them happy too. 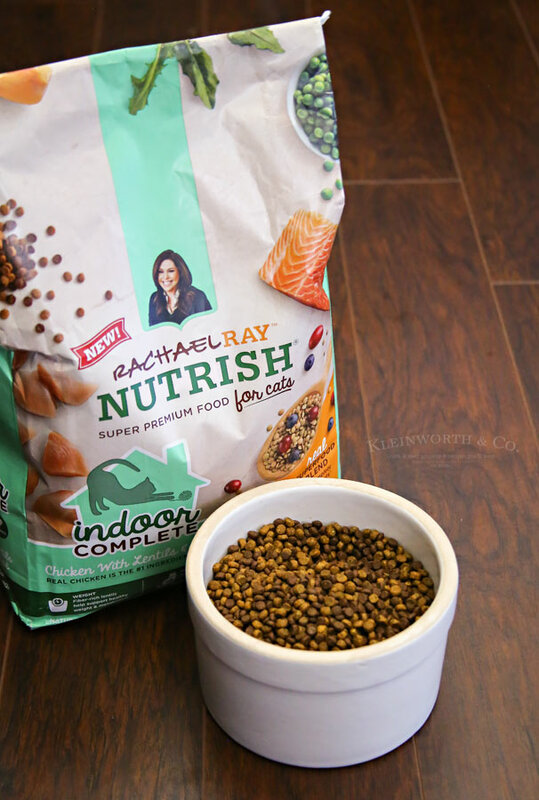 Another thing we all love, Rachael Ray™ Nutrish® Indoor Complete Chicken with Lentils & Salmon Recipe. The natural ingredients are really important to me. I mean, we are trying to eliminate processed food for ourselves, why wouldn’t we do the same for our pets. They are a part of our family & deserve delicious & healthy food too. It’s made with real U.S. farm-raised chicken is always the #1 ingredient, plus real salmon. Lentils to help support healthy metabolism and optimal body weight. It has dandelion greens & pumpkin is nutrient and fiber rich. Dandelion greens also contain natural prebiotics to aid in healthy digestion. There’s even cranberries & blueberries to help support a healthy immune system. It’s all safely USA cooked with the world’s best ingredients. Plus there’s no ground corn, wheat, soy or poultry by-product meal. Here’s a little bit about Nutrish® & why I love it. 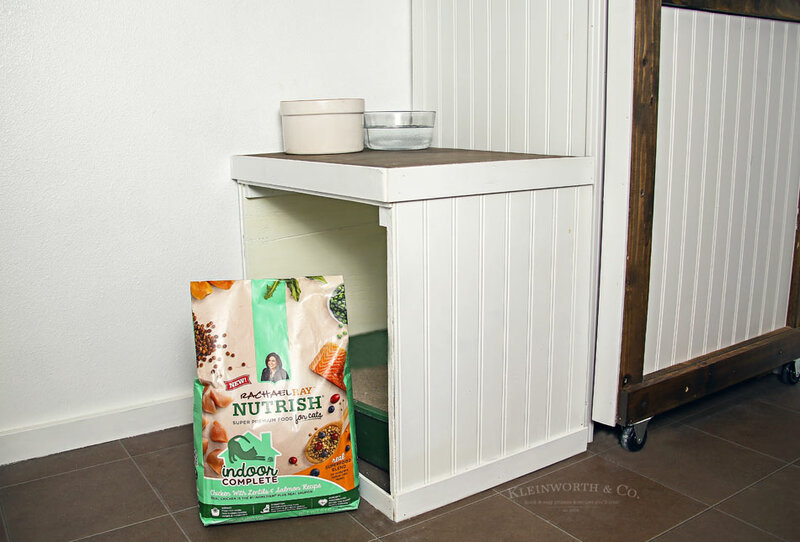 In 2014, with help from cat nutrition experts at Ainsworth Pet Nutrition, Rachael Ray created Nutrish super-premium food for cats. 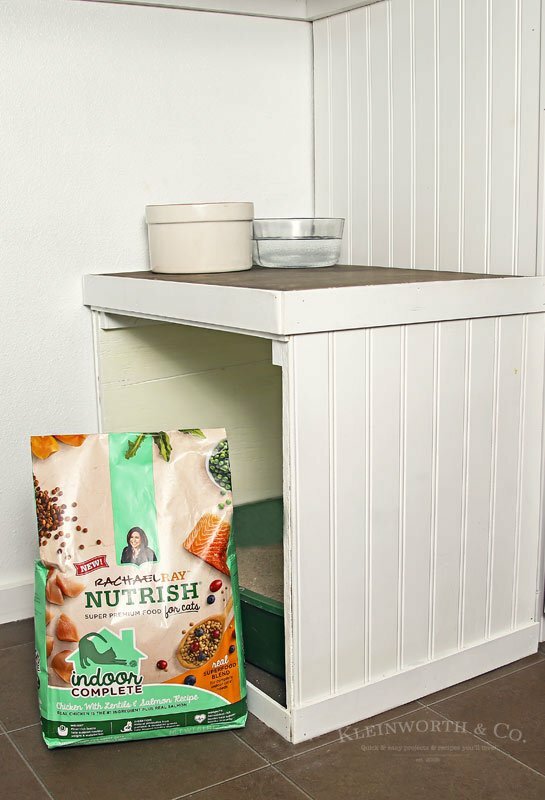 Nutrish dry and wet cat food recipes are made with simple, wholesome ingredients like real meat or fish, and do not contain poultry by-product meal or fillers. A portion of proceeds from each sale of Nutrish is donated to The Rachael Ray Foundation, which helps animals in need through Rachael’s Rescue. Through December 2016, Rachael’s Rescue has donated more than $17.5 million dollars to pet charities and other organizations that do good for animals for things like food, medical supplies, treatments, and more for animals in need. 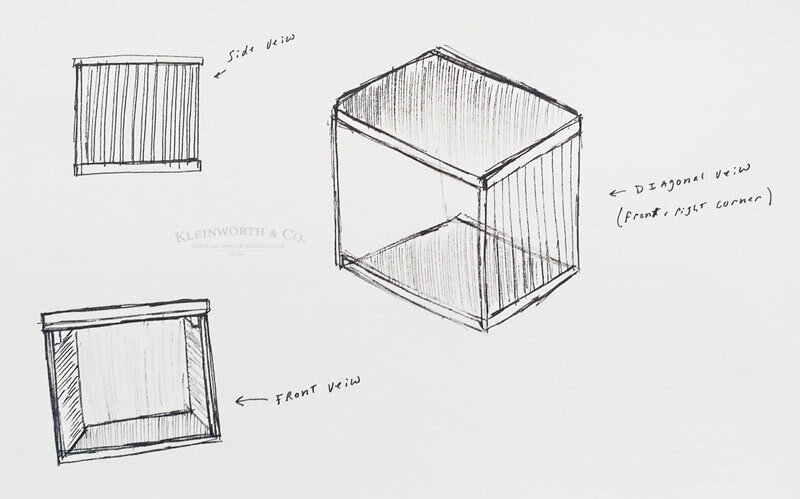 Here is a sketch of how we built ours. Basically, a 3-sided box, open on one side for access. We used beadboard on the sides to match the laundry room & help conceal it even more. I did not include measurements here because litter boxes vary so greatly in size. We made ours about 2 inches larger than the box measurement. So what do you think? Will you build your own DIY Litter Box Cabinet for your cats?